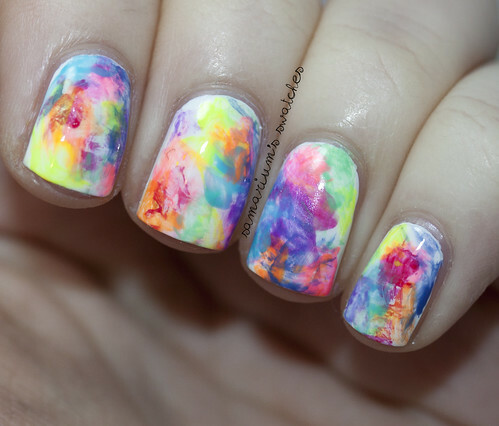 Hey guys, I have a bit of nail art for you today! 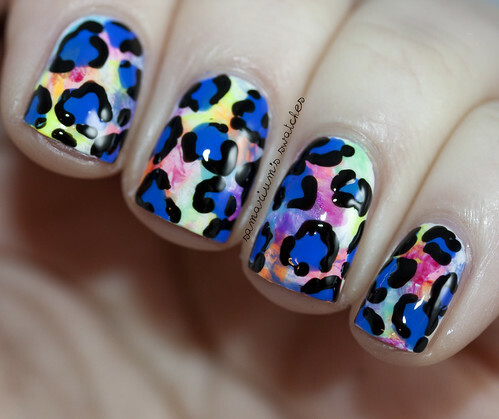 My second freehand leopard print mani! I started out with a plain white base, using Milani White on the Spot. Then using the watercolor mani technique (or trying to lol out of practice!) I added the colors below. Illamasqua -Force, Gamma, Nomad, Poke, Rare, Serenity. 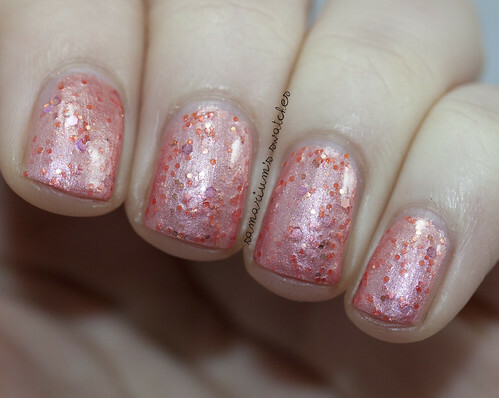 China Glaze - Flip Flop Fantasy & Shocking Pink. I also used a darker pink but I cannot for the life of me remember which! 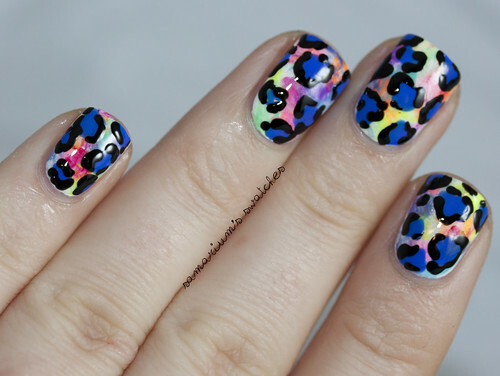 I added the Leopard print with a small dotting tool, Nails Inc Baker Street & Milani Black Swift. Hope you guys like it! Sorry about my dry hands! Today I have Pretty & Polished Pinkie Pie for you! "Pinkie Pie is our sweet nail polish. She is packed full of love, sweetness, and pink! This polish was released last year as an LE Valentine's Day shade and it is back again this year! This will only be available in limited amounts and for a limited time so get it while you can!" I decided to layer Pinkie Pie over Zoya Jacy. I'm glad i did because I think they look amazing together! Bit I also think that Pinkie Pie would look fab over a variety of colors and polishes. I used one coat over Jacy. PP didn't require any dabbing or extra work, it just went on nice and even! You can purchase Pretty and Polished from Etsy and the P&P website. 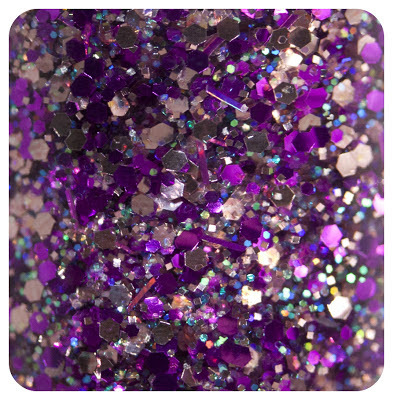 Polishes are priced at $9.00 for a full size 15mL, or $5.00 for a mini 7 mL. 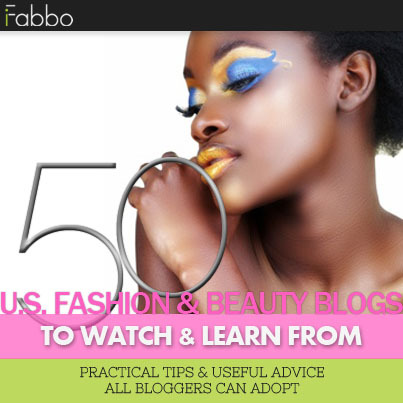 Stay updated with Chels ob her Blog, and with the Pretty & Polished Facebook, Twitter, and Instagram! And on another quick note I started making a Google Doc for nail polish brands and their fonts! You may have noticed recently I started making the glittery filled fonts like above, and I think it's really fun! (What do you guys think?) So I thought there should be a mass doc with the information! Please feel free to add any brands that aren't listed and if you know any of the fonts please add them! Link below! Hey guys! Finally have things back on track a bit, my laptop will be gone for a couple weeks getting repaired so I had to hook up my desktop, so I did and couldn't guess my password lol fail I know! But I have one now and I can edit pictures I take etc! My SD card only had about 1200 D: A lot to do! But on to the post! 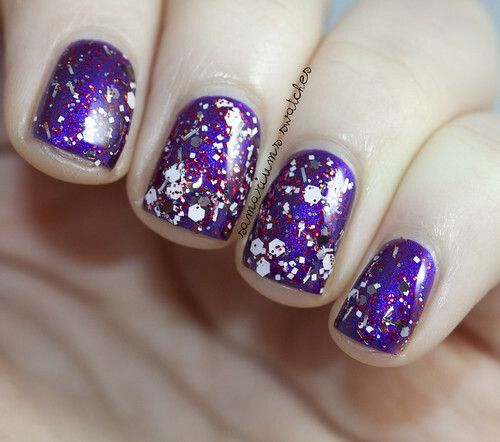 Today I'm posting about another indie brand called Sparkles by Julie! Check out her cute labels! "A Peach colored Jelly Belly! 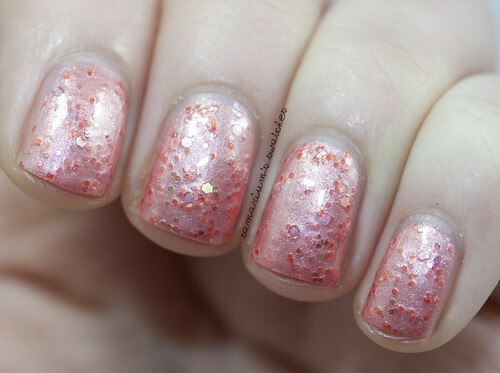 This polish is pink/orange/peachy toned with a gold shimmer, packed with orange, gold and holographic glitters. If you're a girly girl and love Jelly Belly's, you need this in your collection!" 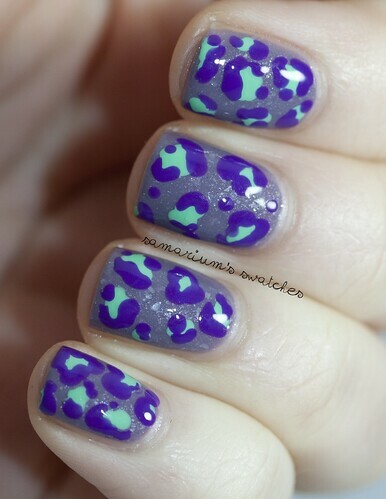 I used two coats for full opacity above. 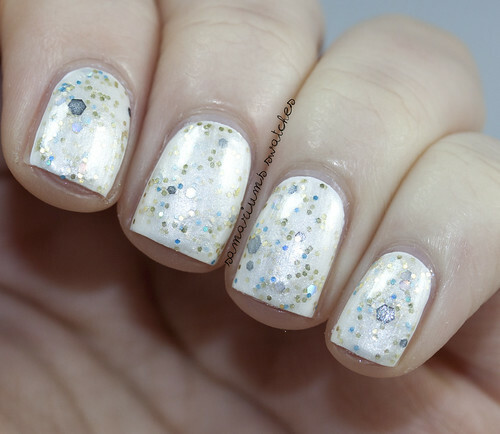 "A beautiful gold shimmering white nail polish, kinda inspired by my pet mouse Lilly, and a bit inspired by the beautiful Water Lily's that magically float around on the murky waters of the world. This polish is packed with gorgeous glitters in gold, holographic, black and a little bit of blue for good measure, do I hear Wedding Bells?" I really prefer this over white, but it builds up easily alone in two coats. 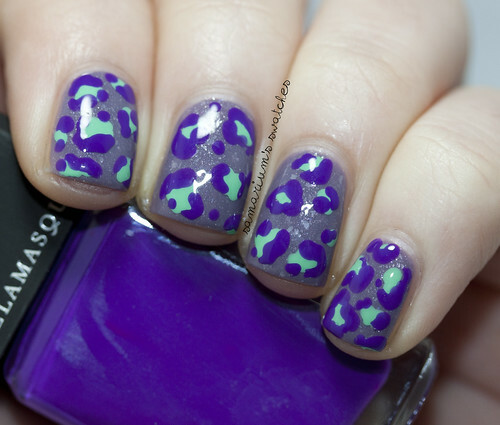 The formulas on both polishes were very good, smooth and a great consistency. 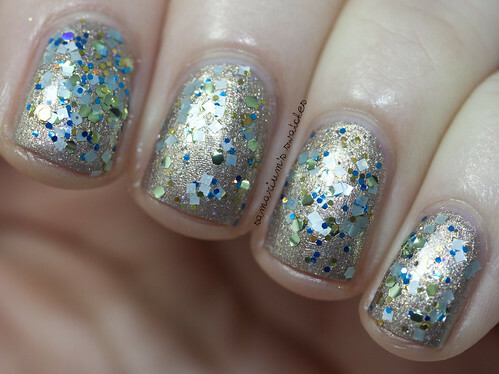 Metallic and heavy shimmer shades with glitter in them seem to appear lumpy in photos but these weren't whatsoever. 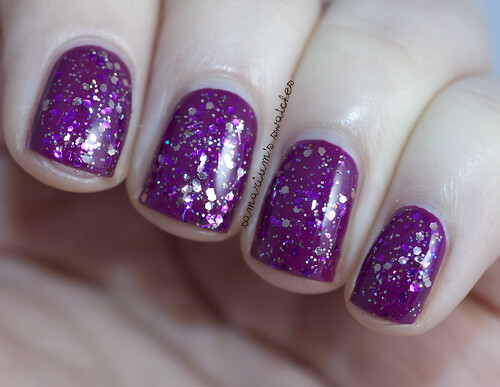 I'm not a very big fan of polishes like this (shimmers with glitter) considering though these are nice. Just not my thing, but great quality polishes! Make sure to keep up to date with Sparkles by Julie via Facebook and Twitter. Julie's polishes are priced at $8.00 ea. in her Etsy shop! Hey guys! 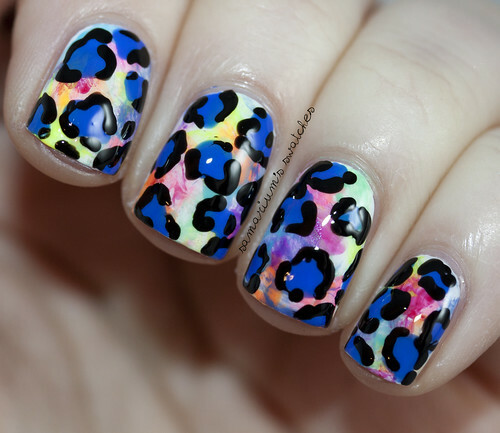 Today's post was inspired by the ever amazing Chalkboard Nails, specifically her leopard print tutorial! I have been meaning to try this for ages! I wish I tried sooner! It is so quick and easy! Mine didn't come out perfect but my second attempt (which you will see soon!) came out even better! But first! Here is the base I layered over, a unnamed franken that I made and love! Hope you guys like it! It was really fun and simple to do! I meant to but my laptop won't turn back on and I have to send it in to get repaired. So I hooked up my desktop, but I haven't used it in almost a year and I cannot for the life of me remember the password. And here I am on my husbands computer, which I loathe because his coloring is so off and it makes my hands look weird, idk how I will edit pictures on this : / Guess I will sort it out! Amywho! Today's post is CrowsToes I make the Path! Scroll down to see various combos! 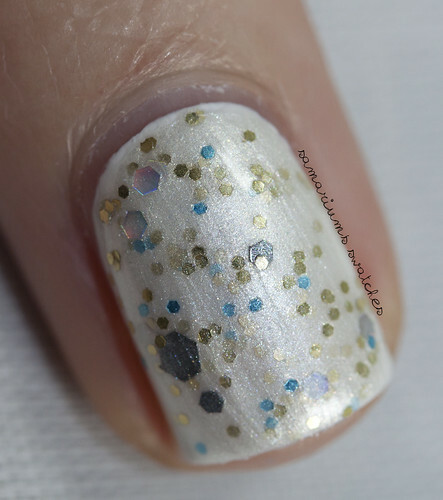 "a clear base with a mix of pastel glitters, pastel blue, green and gold glitters." A single coat over Zoya Bevin. A single coat over Lancome Bubbly Gold. A single coat over Illamasqua Radium. The formula on this was very much like most Crowstoes polishes I have used. They aren't the easiest to spread easily with a single layer. I recommend dabbing and applying it that way. 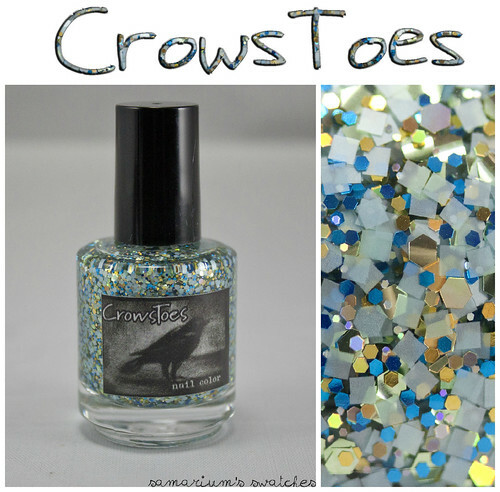 CrowsToes polishes are available for purchase via Bigcartel and Llarowe. Lush Lacquer Ruby Slippers - Swatches & Review! Hi guys! Are you used to me posting so often yet? Pshyeah.. me either! 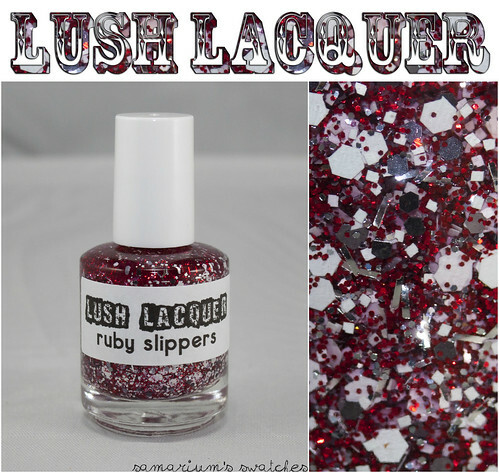 Today's post is the lovely Lush Lacquer Ruby Slippers! 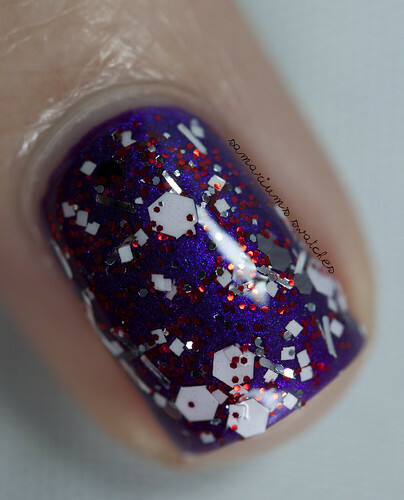 "a mixture of different sizes and shapes of red, white, gunmetal and silver glitters... hexagons, squares, and short bars make up this "sparkly combo""
I layered one coat of Ruby Slippers over A England Ascalon. I was very impressed with the coverage on this polish, I didn't expect it! But still with it chock full of glitter it applied easily. It did clump up a tiny bit in some areas but nothing terrible. Stay up to date with Lush Lacquer via Facebook! They are about to release 18 new shades! Lush Lacquer polishes are available for purchase on Etsy and Llarowe. 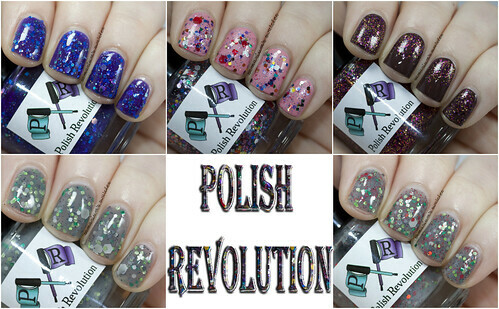 Polish Revolution Nail Lacquer Swatches & Review PartTwo! Hey there! Happy Martin Luther King, Jr. Day! 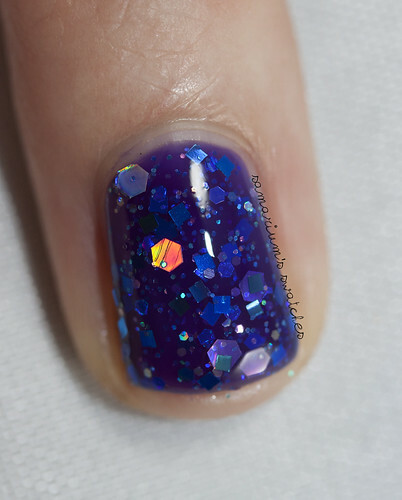 Are you ready for my Polish Revolution Part Two post??! Underground Movement, Vajazzle, What Alice Found, Vegan Zombie, Zombie Christmas. 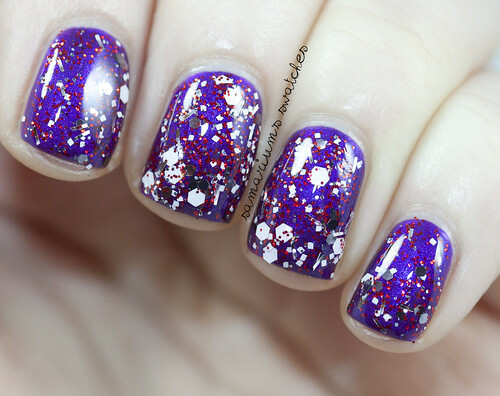 "A purple jelly polish that is chock full of different glitters. Fine glitters are turquoise holographic, turquoise hex and square mix, and iridescent. Medium glitters used are turquoise and blue squares, as well as medium blue holographic. Large hexes are silver holographic." This polish is so up my alley! 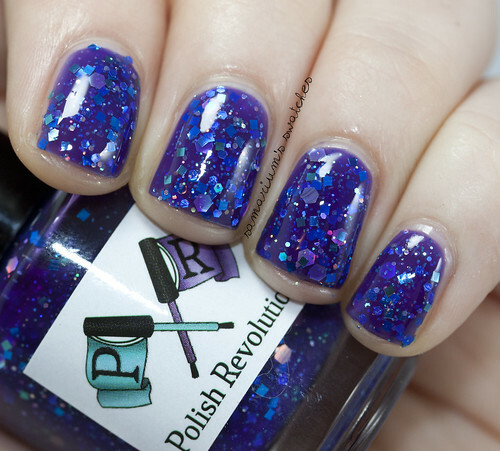 Easily one of my favorites from Polish Revolution so far! But I am such a fan of jellys, purples, blues and blurples! Three coats for opacity. 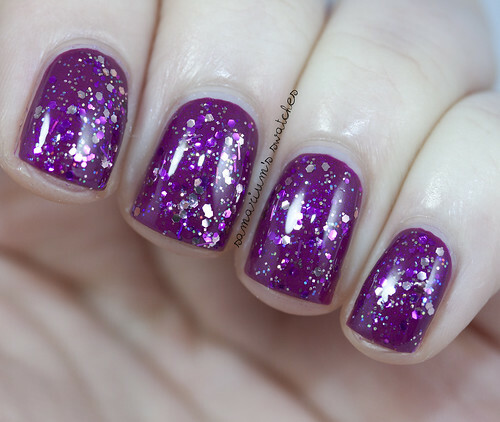 The formula went on really great and the glitter dispersed very evenly. "Vajazzle is made by literally mixing the batches of Puffy Taco and Glitter Herpes, because when you have glitter on your taco, it is called Vajazzle. ;)"
This polish is amazing, I mean how could it not be when it was made from two gorgeous shades? I can't wait to wear it again! I don't feel like the light pink showed it off that well. I used 1.5 coats over Lancome Rose Plumeti. The formula is a little bit thick but workable. 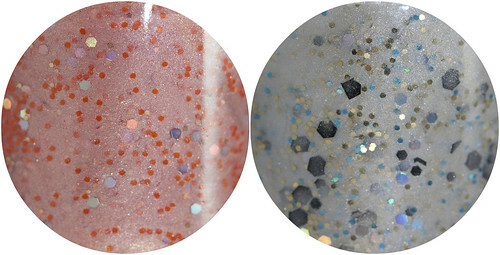 "a mix of fine burgundy, pink holographic, and gold glitter in a clear base." I used one coat of What Alice Found on my pinky and pointer fingers, and dabbed some onto my middle and ring fingers. 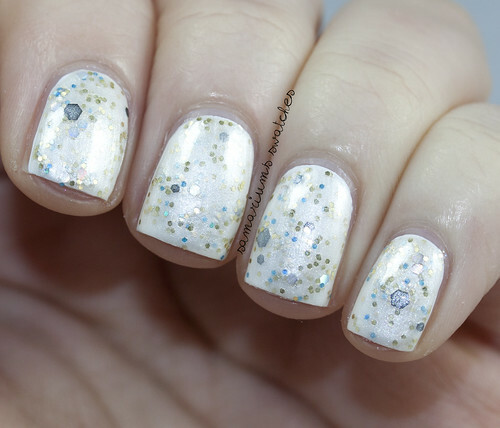 The glitter spreads evenly very easy. Layered over Lancome Chocolat Mordore. Love this combo! It makes me want chocolate covered strawberries..
"This light gray jelly has fine deep blue glitter, medium hexes in light green, light green holo, satin white, green squares, and larger satin white hexes." Never have I ever imagined a Vegan Zombie before...BUT I envision this nail polish being the perfect representation of it! I used three thin coats. I will probably layer it in the future, it's a bit sheer but I love it! "Fine and medium red holographic glitters are hanging out along with large matte red hexes"
I think I may have used four thin coats here, so I plan to layer this next time I wear it. But the effect is really awesome! It is Christmas-y but not overly so to the point that you can't wear it year round. I am really impressed with Lauryn's polishes! They are really fun and she offers a great variety of shades. If you missed it yesterday here is Part One! Make sure you follow Lauryn on Facebook, and Instagram to keep up with the latest polishes and Lauryn's awesomeness! If you order from Shoppe Eclecticco use code 2OFF40 for $2 off a $40 Purchase. Here is a collage recap! Which is your favorite?! Candeo Colors Fallen - Swatches & Review! 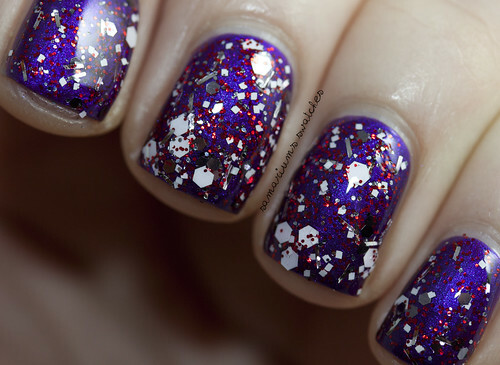 piCture pOlish Atomic - by Samarium's Swatches!!! Initial Lacquer Swatches & Review! 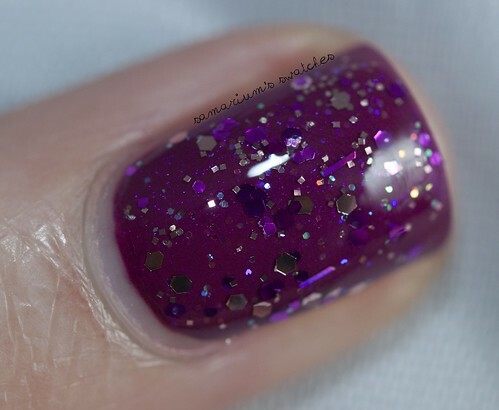 Lynnderella Pentimento over Zoya Jacqueline! My Top 12 Polishes of 2012!